Jumping Rock HD is an free action game developed by Cube Studio Inc. for Windows 8 and 8.1 desktop. The game is different from other action games. 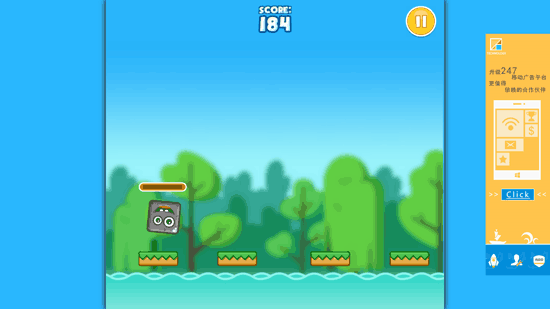 The main character in this action game is a square shaped rock that has to clear the levels and stages by overcoming different obstacles that are brought in front of it. 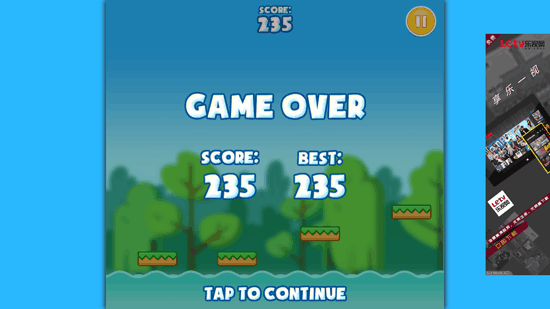 The game has the initial story as a rock which has to clear the obstacles he faces such as clearing the river by jumping on the bars hanging in the air. In this game, the player has to click anywhere on the screen so that the fuel system of the rock starts moving from left to right. Fuel is shown in a small level bar over the head of the rock in yellow color. The filling of the fuel towards right side means it will jump higher and will go farther but if you click when the fuel bar is towards left side then the rock will jump very slowly and will not go only nearby. As you keep moving forward in the game, you keep scoring higher score. Jumping Rock HD has impressive graphics that make it stand out from the other similar or some of the other action games. The colors of the game grab the attention of the player and make it a great game to play again and again. It also has good music added to enhance the game play much more interesting. The game has no settings or options for any kind of change in the game. There are no difficulty levels or other settings that you can define before playing the game. There is a leader board on the main menu of Jumping Rock HD where you can see who has scored high scores and what is your score.